A couple of things to follow up on that Vicksburg Post article about when David and three of his friends carved "Remember Duane Allman" into the side of a Mississippi road cut. A scan of the Vicksburg Post of October 15, 2007 (it's the article I had previously linked to, but I scanned it so you can see how big it was on the front page of the Post ). A detail from the photo the Post printed showing David Reid standing next to the 6 foot high carved letters. 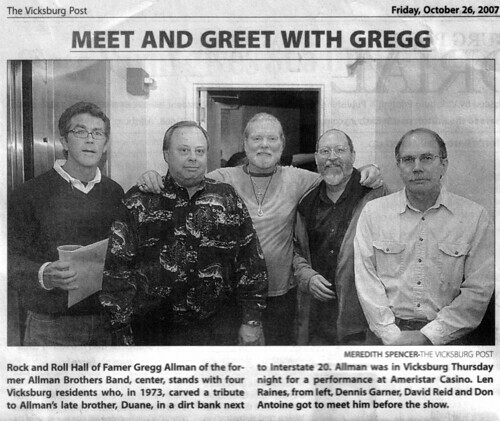 Above, the Vicksburg Post of October 26, 2007 -- the four fellows got to meet Gregg Allman. Update: Don Antoine loaned me some slides of the carving in progress to scan in and I did so.